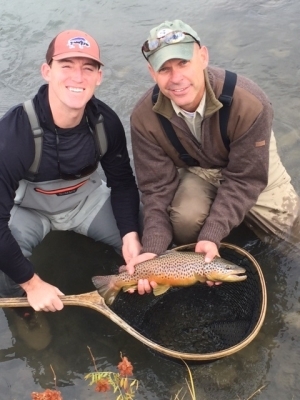 Guided fishing on private ranch access, Healing Waters Lodge guest, Wayne, caught this terrific Brown on a Sparkle Monkey, assisted by his pal, Cade. Cool temperatures this morning, overcast skies, no wind. Perfect!